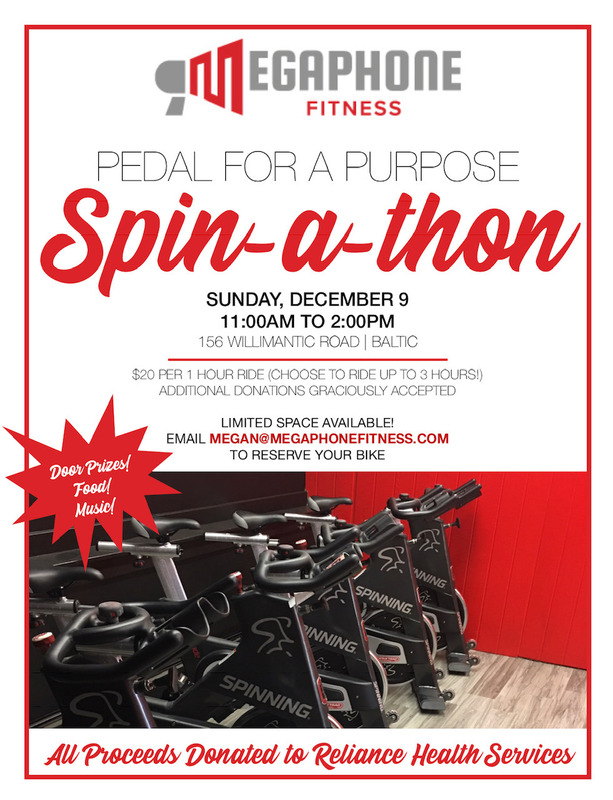 Megaphone Fitness is hosting Pedal for a Purpose SPIN-A-THON on Sunday, December 9th at our fitness studio at 156 Willimantic Road in Baltic (next to the Chelsea Groton Bank). All proceeds will be donated to Reliance Health Services in Norwich. $20 minimum donation per hour ride. Choose to ride up to three hours! Additional donations and sponsorships are graciously accepted! Limited spots available – Email Megan@megaphonefitness.com to reserve your bike and choose your time slot(s). If you are interested in donating a doorprize or helping with the event, please email Megan. Reliance Health is a private 501©(3) community mental health agency with a mission of enhancing health through mental wellness. Their programs help individuals find and preserve stable housing, advance educational goals, gain career experience, develop social networks, maintain employment and advance day-to-day life skills.